If there is no bread, you might want to eat cake, but that would only lead you to the guillotine. 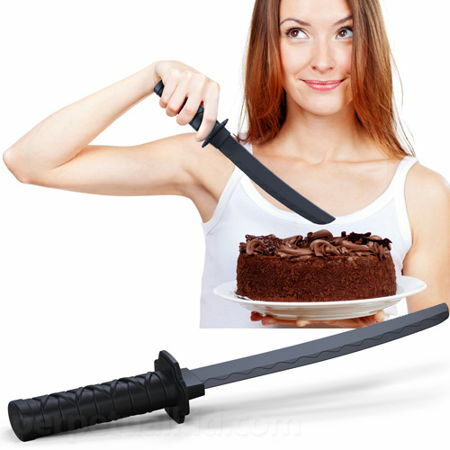 It is a good thing then that cake is a whole lot more affordable these days, and what better way to share the joy than with the rest of your mates, thanks to the $9.99 Cake Samurai Knife? Cut up your cake expertly with this particular cake knife that sports a truly unique design, and who knows, you might even be able to master the art of putting out the candles with one swift stroke of the Cake Samurai Knife – not via cutting up the candles, but rather, to generate enough forceful winds to extinguish them. Touted to be among the finest of all cake weaponry, it comes in a shade of deadly black and is molded from food-safe polypropylene plastic, measuring 12″ in length.